GUIDE RAILS, RECTANGULAR BARS AND WEAR STRIPS TEFLON ® AND PTFE On Fluoro-Plastics, Inc.
Fluoro-Plastics/Surf Technologies stocks standard guide rail shapes: cover bar, chain guide, snap-ons, half rounds, and j legs in various sizes for applications where temperatures exceed 180 deg. F. All shapes are extruded from granular PTFE, which is the toughest kind of PTFE and is ideal in conveyancing systems to quickly and easily move products and materials with no breakage, reduced chatter and noise and little downtime on the line. Virgin PTFE is FDA approved. It is non-stick, has zero water absorption, withstands corrosives, is non-aging, easy to cut, machine and install, and has good flexibility and a long service life. PTFE guide rails and wear strips will operate in the harshest chemical environments and in temperatures from -350 deg. F to over 500 deg. F, making them ideal for food processing, sterilization applications, chemical processing industries, cosmetics industry and many other high-tech industries where products have to travel over or along metal rails through harsh environments at high temperatures. PTFE guide rails and wear strips will provide thousands of hours of continuous, economical service where all of the melt-processible plastics fail. Standard lengths are 5 feet and 10 feet, but non-standard lengths are available. Fluoro-Plastics stocks an extensive array of rectangular bar sizes for use as a slide surface in ways and slots. RailMaster™ Guide Rails and Wear Strips are replacements for use in high temperature conveyor systems. They’re made of virgin granular PTFE (Teflon®) for longer service life to help reduce downtime. Whatever your system, chances are we have a stock profile to fit. Custom profiles also available. 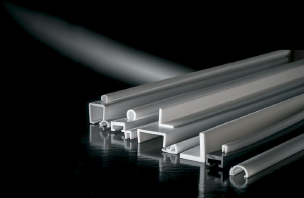 Call today or see our website: www.Flouro-Plastics.com (guiderails, wearstrips, rectangular bars and profiles). Stocked in 10 and five foot lengths; custom lengths available on special order.